Los Angeles-based author and visionary Elaina Redmond recently released her new children’s book The Power of the Penny which teaches children the values of civic duty, philanthropy and financial literacy. In addition to promoting the book, Ms. Redmond sees it as a tool for starting a whole movement and program with the mission of rebuilding America, both economically and spiritually. Inspired by her personal hero Abraham Lincoln, Ms. Redmond believes in teaching children from a very young age how to save and also give back to their communities. As quoted in her book, "The penny teaches us that no matter how big the world around us is or how small we might feel, each of us can make a difference everyday." Abraham Lincoln is the crux of the book’s message and whom Redmond portrays in her book as “the role model for kids becoming heroes in their own lives.” By teaching children the values of savings and service that Lincoln himself displayed as a human being and leader, Redmond states "we can make big change!" Redmond has also established the Penny Program, where banks and schools make it easy for children to learn about money and civics and start savings accounts. To facilitate the Penny program and book donations to local schools and clubs, Redmond has established The Power Of The Penny Foundation, am emerging nonprofit that is fiscally sponsored by the Pan American Bank Scholarship Foundation in Los Angeles. Donations to the foundation are 100% tax-deductible. The Penny Program is in the process of being formatted with The National Liberty Museum in Philadelphia as an ongoing exhibition. Schools, libraries and other organizations, including Popular Community Bank, Little Gym in Torrance and San Diego Library are already using the Penny book and program to spread the crucial message of fiscal understanding, civic duty, and hope among today’s youth. I think most of us when we pick up a penny or look at a penny, we do not think much about what is inscribed on the penny or maybe even the man who is on the penny. Elaina Redmond has taken the penny and brought new purpose into its meaning . 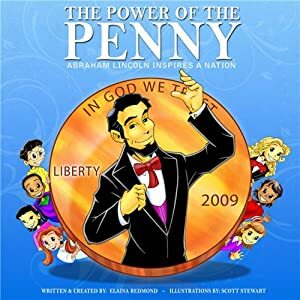 With the explanation of what the words liberty, In God We Trust, and E Pluribus Unum mean, Elaina has written a story for children (and adults) about the Power of the Penny and the inspiration in the life of Abraham Lincoln. She challenges her readers to become like Abraham Lincoln. She wants us to focus on being kind, remembering that one person can change circumstances in their life or others lives, to practice honesty, persistence, and treating others with respect. Elaina reminds us that the men and women who helped form our United States of America based the Declaration of Independence on those principles and the principles of equality for all. This is an excellent book and I encourage each adult to read it to their special child. However as I mentioned above, it is story with principles for adults too. 2013 Walt Disney Studios Motion Pictures Slate!!! Enter to Win A Walt Disney World Vacation! 24 great new deals from RadioShack this Friday! Cee Lo Green's "Mary Did You Know"
Holidat Gift Guide - Electronics for Anyone! A free subscription to the "Read Conmigo"